We are a 4 generation family who works primarily in creating traditional rag rugs and textured rugs. We also have expanded and now hand spin our own Jacob Sheep and Alpaca fibers and various other wools & llama fiber. We have packaged fiber and skeins of yarn available. We also have rugs, table runners and decorative weavings made from the spun fiber. Homespun Family is expanding to processing animal fibers & spinning & weaving as well as our woven rugs. We now have 5 Alpaca: Larry, Blue, Snuggles Jr., Mocha and Buddy! We also work with our own Jacob Sheep wool This is a rare breed of sheep that produces a wonderful black & white wool. 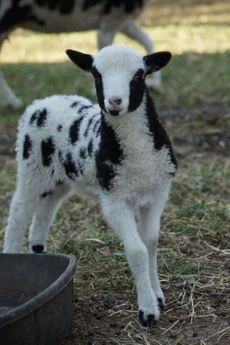 This breed of sheep is very interesting as they can produce up to 6 horns! We have Alpaca, Llama and Jacob Sheep available in packaged rovings and spun yarn. All of our spun yarn is done the "old fashioned" way - by hand! This family tradition started with Florence many, many years ago. She made thousands of rugs created on her loom that her granddaughter now has. Florence's daughter and son-in-law started Homespun Family a few years ago. Joyce enjoys working on rugs on the loom, spinning, crocheting, and tatting. David & Joyce have 4 children, 9 grandchildren and 10 great grand children who they cherish very much! Bonnie is the oldest daughter and she enjoys working on rugs, spinning and weaving and creating needle felt artwork. The 4th generation: Casey & her husband: Joel raise now raise Jacob Sheep that we get the wonderful wool from along with the Alpaca fiber. Rugs and other items are always on hand so if you are unable to make it to any shows and are interested in an item-feel free to contact us. We are proud of our creations and love to share them! Our family is very talented and we give God the glory for each individual talent. It is our hope that we will be able to pass this art down to many generations to come!